All Star MA hasn't added a story. Goals: Competing and winning World TaeKwonDo Championships, Pan Am games, and other international competitions. Why I want to be a champion: Competition taught me that no matter how many times I lost, I realized there’s always a chance to learn and become better as an athlete. To be a champion, I have to fight for a cause. I want to bring pride to my team and my family. They are my motivation and drive to be the best at the amazing sport of taekwondo. Hi my name is Tahmina Amini ( A.K.A Tam Tam), I am 14 years old and I am currently competing as a member of the Canadian National Team on the world stage. I have been practicing taekwondo for 4 years and I have won many tournaments from provincial all the way to international competitions. My greatest accomplishments to date have been placing 2nd at Canada Open and 1st at the Canadian Nationals this year, and securing a spot on Team Canada to Compete at the first ever World Cadet Championships in Azerbaijan. Hi my name is Mona Parhar, I am 13 years old and I am currently competing as a member of the Canadian National Team at an international level. I have been practicing taekwondo for 4 year. 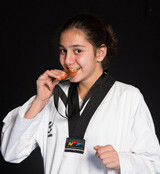 I have been dominating the Girls Cadet Heavy Weight division across Canada. My greatest accomplishments to date have been winning gold at the Canadian Open and taking a silver at Nationals this year to secure my spot on Team Canada to Compete at the first ever Cadet World Championship in Azerbaijan. I have been devoting all my free time to train and constantly push myself to keep my position as Canada’s top Heavy Weight Female Cadet. I know all my sacrifices will pay off when I represent Canada in the first ever Cadet Worlds. I am confident that my team will do very as well we have a great support system set up to help us achieve our goals. This game is only the beginning, like most of the athletes on our High Performance team, going to the Olympics is what I am working hard towards. All Star MA hasn't posted any updates yet. All Star MA is managing the funds for this campaign. The campaign is for a personal cause.